AtwoodFest 2014: The music schedule for the first annual AtwoodFest is online at AtwoodFest.org. Click on “music” and it will take you to the schedule for both stages on both days (July 26 & 27) as well as give you full bio’s, music, video, and links to the performers’ Facebook, Reverb Nation and website. If you are planning to use your smartphone, once you get to the music schedule page, click the word “Mobile Site” and you will be swept away to a smartphone enhanced site. For the first time, you will be able to take the schedule around with you at the festival so that you don’t have to miss the artists you want to see, or try to find a banner or poster. And give it up for my mom, she’ll be feeding over 110 musicians backstage at AtwoodFest. Viva la Meatballs! Chris Aaron Band with Jim Schwall: Just added to AtwoodFest lineup on Saturday, July 27th. Two legendary Wisconsin blues guitarists from two different generations join together to bring a unique spin on rockin’ blues! Jim Schwall gained fame in the ‘70s with the Siegal-Schwall Band, and Chris Aaron has been slining it for well over 20 years with bands like American Standard and Bandallmas! Add Pauli Ryan (Garbage, U2, Clyde Stubblefield) on percussion, Aaron’s wife Lisa Bethke on vocals, and pull a bassist and drummer from Chicago and you have a really fun, powerful blues band. Eastside Club: The Sunset Music Series on Thursday nights at the ESB is a whole lot of fun! Live music by the water’s edge, a Tiki Bar serving Rökker Vodka on special, and a sunset taking form behind the capitol. Hard to beat that! Adventures with Lizzie & Nikko: Lizzie has been elected one of the team captains for the Pom Squad. She worked very hard to get there and I am very proud of her. She is very motivated and a good leader who leads by example. 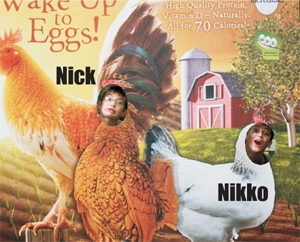 Nikko is back in summer camp along with his best bud Nick. They get to swim, go on hiking trips, scavenger hunts, laser tag…. I think when I went to camp they had masking tape, construction paper, crayons and Elmer’s Glue. There weren’t even friendship bracelets back then. Enjoy this pic from the Vilas Zoo.